Looking back over the years long since past; before the railroad came through this valley and before the villages appeared along its line, like beads upon a string, I, as a young girl, taught my first term of school in Ableman, then a very small hamlet. It occurred to me that perhaps a picture of that village as it was in those by-gone days might be of interest to this society, whose members have been drawn together by their common interest in the long ago, and the beginnings of things. To those of you who know of it as it looks today, with its substantial addition of comfortable homes between Narrows Creek and the west bluff of the river narrows, and its still prettier growth along the shady road east of the river, Ableman, as it looked when I taught in its log schoolhouse, was surely at its very beginning. The main road, i.e., the river road following the west bank of the Baraboo river from the south across the Narrows creek near its union with the river, north through the river narrows, and the road from the west through the Narrows Creek narrows, east across the river towards Baraboo, crossed each other then as they do now, and formed then, as, the main streets of the town. In the corner of this crossroads, where the Ableman bank now stands, stood the store of J. G. Stein, a two-story building, store below and dwelling above. His two little girls, Louise and Lilly, went to school to me. Across the creek there were no houses, except possibly two or three small ones on the west side of the river road near the creek bridge, until, just at the opening of the River narrows, there was a two-story house occupied upstairs by Sam Carpenter and his bride of a few months. He was a tinner and had a shop in the center of town on the south side of the main street. A Mr. Armstrong had a shoe shop south of this street also. And his daughters went to school. 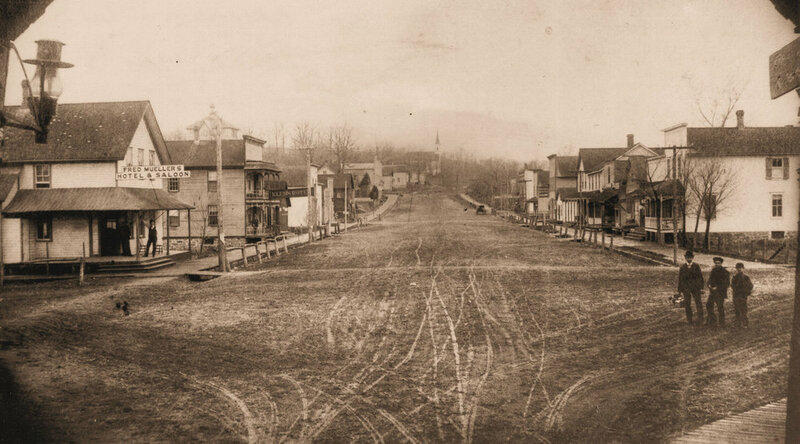 Directly south of Stein’s store, across Main street, stood the Charter House, a large, two-story hotel, with a porch across its whole front and extending back some distance along the west. From Stein’s store, across the whole flat, to the rise of ground west of where Langenhan’s blacksmith shop now stands, and between the main street and the creek, lay the great mill yard, with the mill on the creek bank of it. I can see it now as I saw it then, full of wagons, and teams going and coming continuously with the business of the mills, which was thriving at that time. Later the introduction of steam power and the uncertainties of the creek water power, as well as, perhaps some other things seriously interfered. About half way between this place and the school house, down in a hollow back from the road, was a queer group of buildings, very small, and built of logs, among a tangle of small trees and bushes, where a queer old man called Old Michel, and his as queer daughter lived alone. The dwelling was a little larger than the rest, but very small. Near it was another much smaller-his oven where he baked his bread; still another was his smokehouse. There were others still, but what they were for I do not know. They kept by themselves and meddled with nobody. The daughter visited the school one day dressed in a remarkable fashion, and I think that was the only time I ever saw her. On all sides of my schoolhouse was open ground with nothing to prevent all kinds of animals from roaming at will, and we were often the center of an interesting and, at times, quite noisy, flock. Hens wandered in through the door in search of crumbs from the children’s dinner pails; a flock of sheep came nearly every day and often gave concerts which seriously interfered with recitations until they could be driven way. There was also a donkey, shaggy and grey, called Locomotive, belonging about the mill. He was quite apt to make daily visits and serenade us vociferously. All of those things with some of the children served to furnish the variety and spice of life. One day a hen, in quest of crumbs, started in just as a youngster started out. As they met on the threshold with a squawk and a squeal which upset the decorum of the rest of the school for a minute, myself included. One other day, in the geography lesson, the question, “What is the greatest republic in the world?” was asked and immediately answered by Amy Greeney with, “The Baraboo Republic!” Then she clapped her hand over her mouth, but too late to keep it in. Another day Amy and another little girl were a little late in the afternoon and when I inquired the reason she said, “Well! We went snaking and we made up our minds not to come back until we have two apiece.” They had them. The Charter House was kept by Ed Watson and his wife (Col. Abelman’s daughter and her husband) until it was burned down many years later. They kept a good hotel and set a very good table, but were too hospitable to get rich very fast. If I remember aright, that was one of the marriages that proved a failure; but Jim Castle, a very slender, wiry, energetic little man, was one of the prominent characters about Ableman for many years,. I do not remember what became of him, but I have a blurry recollection of him as here, there and everywhere, and doing all sorts of things. One distinct memory I have of seeing him come out of the Charter House one morning, and go down to the river, where he threw a cat into the water. That time, however, he tackled something quicker than he was, for the cat got back to the house before he did. About as far to the northeast as General Stark’s home as to the west, on top of the east bluff of the river narrows, lived another family, well known and prominent in those early days; Mr. Curry, his wife and daughter, Mrs. Victor Peck, with her two children, Anna and Willie. Anna went to school that summer for the first time, and I remember well, her grandfather bring her, a wee girl, that first morning that she came. Of the four homes most prominent in my recollections of this time, Gen. Stark’s large farmstead, then owned by his daughter and her husband, Mr. And Mrs. Greeney, had the finest and most imposing house and surrounding grounds. It was a large square house with a long and wide flight of steps leading to a large porch in front, built part way up the slope of the northern ridge shortly before the northern and southern ridges draw in to form the Narrows Creek narrows. The farm lay on the side hill and the meadows within the sweep of the Narrows creek on the east and south to the narrows. It was, and is, divided through the center from west to east by the road from Narrows Prairie through Ableman and Baraboo. This road, the length of the farm was bordered on either side by a row of beautiful maple trees at regular intervals, and the slope to the house was well filled with very beautiful trees and shrubs. In the course of the years many of the trees have died and had to be removed, but the farm is still beautiful. I have spent many very pleasant days with my dear friends there, one of whom still lives in the old home. My memories of the Curry home are of a large house and yard completely filled and covered with flowers. Mrs. Peck loved flowers and had them everywhere, out of doors and in. I particularly remember some very large cacti, which were often covered with great pink or red flowers which were magnificent. On the east bank of the river directly across from the Charter House, and from the Baraboo road to I do not know how far south or how far east, was Col. Ableman’s home. The house, wide for its height, with a large porch across its whole front, stood far back from the road. The ground in front was enclosed by a fence and well filled with very large and beautiful trees. There was a gate in the fence near the house, opening between the front yard and a long lane between the house and the barn some distance southeast. East of the lane, fenced in to keep out the hens, was Mrs. Ableman’s great vegetable garden, which had everything in it in that line that anyone would like to eat. At the road end of the lane was a great gate which was generally open; also a small gate for pedestrians’ use if the large one happened to be shut. In the great yard between the house and barn and south of the house was much vacant space, and many things for use each in their place. In the summer time many motherly hens scratched and foraged for their little families, and the long clotheslines flung their banners to the breeze. Col. Ableman and his wife made this old house a home to everybody who came there. It certainly was to me, both when I boarded there, and afterwards, and Mrs. Ableman was a second mother to me. She had a bevy of young nephews and nieces who liked nothing so well as to spend their summer vacations with Aunt Mary. Then, the old place and the whole of Ableman was full of life; and pranks were many and various; though I never knew such a lot of youngsters who could do so many funny things and never make themselves obnoxious. The two boys were crazy one year to take Ed Gilmore’s gun into the woods hunting, much to their Aunt Mary’s dismay, as she thought them too young to be trusted with it. Finally in self-defense she asked me to hide it as she said they would not suspect me. Finally I did and said nothing about it. Before long I heard Irving Dean asking Mrs. Ableman where the gun was, but she said she didn’t know, if it wasn’t where it usually was. After hunting and fussing a long time, he came to me and asked me if I knew where that gun was. I looked up and asked what he supposed I knew about the gun. Ad he did not really suppose that I knew anything, that ended it, and I got off easy, saving Mrs. Ableman from any more worry, for he didn’t find it. Two of the girls are now doctors, Riri Dean, a tall girl with very dark eyes and lashes and very fair hair, brimming over with fun and mischief, is now Dr. Marian Dean, quite a famous physician and surgeon, in Helena, Mont. Lois Nelson, the last I heard, was a doctor in a hospital in San Francisco. One evening during that summer a sister of G. Butts, who lived there, was married to a man by the name of Tubbs. The rain fell in torrents that day and evenings, and night. In the late evening Ed Gilmore came home from over the river, and as he came in all dripping from the rain, he said “Well! This is a fine evening for tubs and butts.” It certainly was, and next morning all the flat about the Charter House, mill and Stein’s store was under water, and Jim Castle and other Charter members were punting about in boats for some time before the flood went down. They said that Narrows creeks was liable to rise suddenly in that way, but I never saw it do it again. Now Ableman has changed the little log schoolhouse to a fine large building of several rooms filled with strangers to me; and the youngster I knew have grown up and gone away to live their lives elsewhere. Some times the memories crowd thickly, and it is hard to know where to stop. The snow is nearly gone, except in the banks, closing over one hundred days of sleighing without a break. Can you beat the record?